Besides the Thanksgiving day treats, we also made plans for breakfasts and lunches. We’re going to need to eat well if we plan on doing any Black Friday shopping. And we’ll be shopping till we drop, well from the computer anyway. We all absolutely despise fighting the crowds on Black Friday. However, we all love to check out the deals on Amazon and on online at our favorite stores on Black Friday. It’s easy and painless Black Friday shopping that we can do in our pajamas with a mimosa in one hand and our tablets in the other. We’re making a small turkey and small ham this year. So we were also planning out the recipes that we’ll make with the leftovers. One of my favorite recipes to make when I have leftover ham is a Croque Monsieur. It sounds and tastes super fabulous, but it’s cheap, easy and so quick to make. 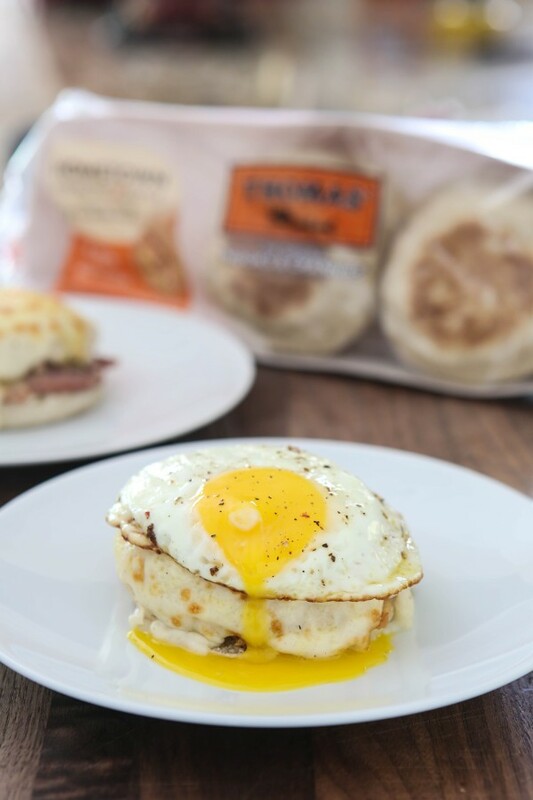 So on my grocery list, I added my family’s favorite fresh English Muffins from Thomas’ Bagels. 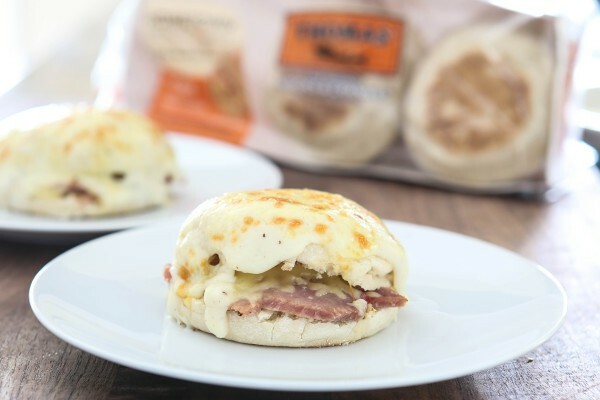 I’ll be using them to make these incredible Croque Monsieur Muffins with the leftover ham for breakfast for everybody. 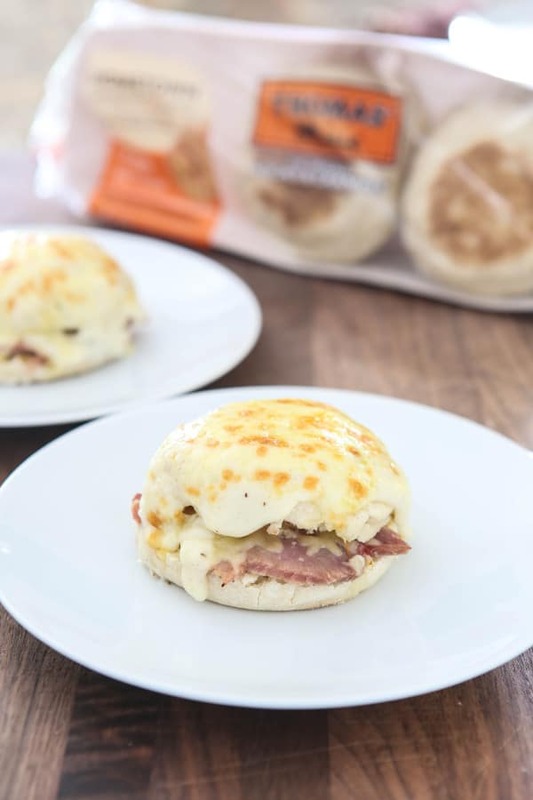 These are so delicious and make the perfect super easy and “fancy” breakfast or brunch for friends and family. I’ll serve these with fresh fruit and mimosas. To make these, I just make a simple Béchamel sauce on the stovetop. It takes just a few minutes and tastes wonderful. 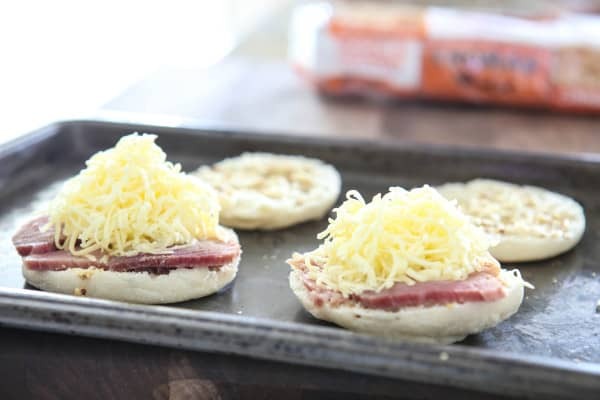 Then I take the English muffins, and spread on some Dijon mustard and layer on the leftover ham. Next comes the cheese. Gruyere is traditional, but I also really like to use Dubliner cheese too. It’s got a milder flavor that goes great with absolutely everything. I even make pizzas with it. After I make the little sandwich, I top it with the creamy Béchamel, and more cheese. Then I just place this under the broiler until the cheese is melted and started to brown. It’s so simple! Then you have this creamy delicious wonderful yumminess. So perfect! But if you want to make it really over the top, let’s go ahead and add a fried egg and make it a Croquque Madame. Oh my! This recipe works best with plain English muffins. Assemble sandwiches by dividing English muffins in half and spreading each side with a little Dijon mustard. Add a slice of ham and about 2 tablespoons of grated cheese. Add top half of English muffin. Spoon Béchamel sauce and top of sandwich and then add about 2 tablespoons more of grated cheese. Place sandwiches under the broiler for just a few minutes, or until cheese has melted and lightly browned. YAAAAAAS! I haven’t had a proper croque monsieur in ages, mostly because they’re so rich that I can never finish the whole thing (or I do, and then feel gross for the rest of the day). Croque Monsieur = the best thing ever! Oh my and in MUFFINS! yes please! I can’t believe how quick this year is flying by! How is it already Thanksgiving!?! MMM, that yolk is screaming my name! We LOVE Thomas’ in our house, they are perfect every time! My fellas would be so thrilled if I served up these egg sammies on the day after Thanksgiving. You’re smart to avoid the crowds and shop from home. I would totally devour these! I want to run into my kitchen right now and make this. This looks so amazing and inviting. My hubby would go nuts for this. 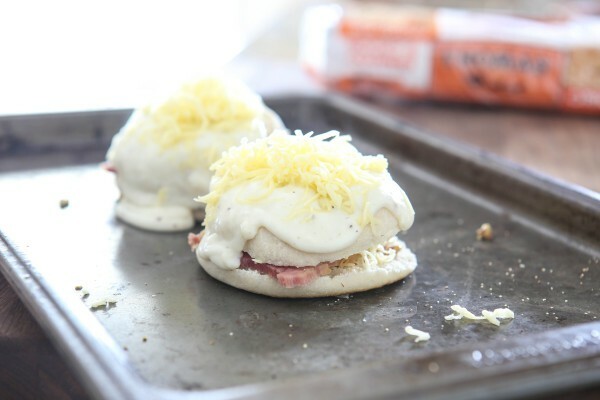 What a great quick way to make croque monsieur! Although I think I’ll definitely be going for the egg as well! Crouque monsieur are one of my favorite sandwiches! 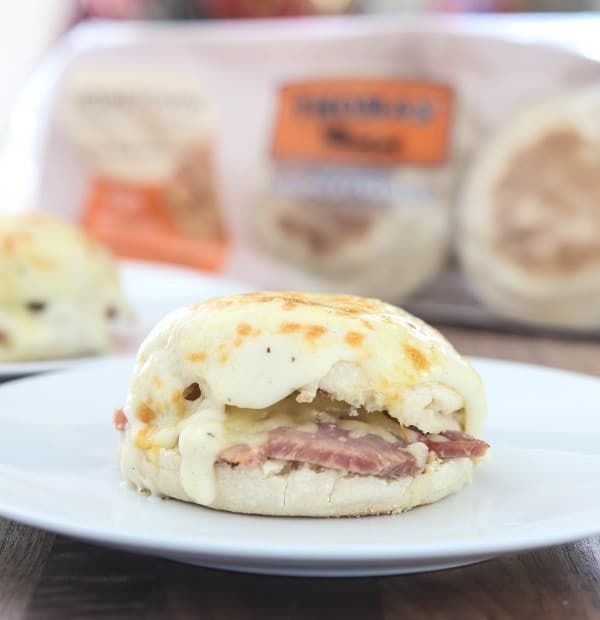 I love that you made it on a perfectly toasted english muffin.